As their world comes undone, the Courtlands are drawn into a vortex of dread and recrimination. Why weren’t they more careful? What has happened to their daughter? Is she alive? Will they ever know? Caitlin’s disappearance, all the more devastating for its mystery, is the beginning of the family’s harrowing journey down increasingly divergent and solitary paths until all that continues to bind them together are the questions they can never bring themselves to ask: At what point does a family stop searching? At what point will a girl stop fighting for her life? 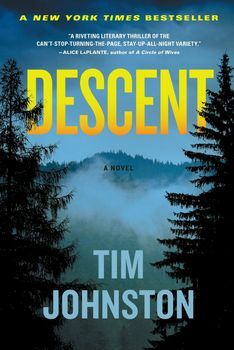 Written with a precision that captures every emotion, every moment of fear, as each member of the family searches for answers, Descent is a perfectly crafted thriller that races like an avalanche toward its heart-pounding conclusion, and heralds the arrival of a master storyteller. The Rocky Mountains have cast their spell over the Courtlands, a young family from the plains taking a last summer vacation before their daughter begins college. For eighteen-year-old Caitlin, the mountains loom as the ultimate test of her runner’s heart, while her parents hope that so much beauty, so much grandeur, will somehow repair a damaged marriage. But when Caitlin and her younger brother, Sean, go out for an early morning run and only Sean returns, the mountains become as terrifying as they are majestic, as suddenly this family find themselves living the kind of nightmare they’ve only read about in headlines or seen on TV.